Does it get any better than this? Tottenham�s second-half demolition of Manchester United last night wiped out all that pain Spurs have experienced at Old Trafford during the last half a century. Ok, there�s a long way to go to the finishing line, but at least Tottenham have got off to a flier and share the lead at the top of the Premier League with their three wins. Tottenham�s performance made a mockery of all the negative talk during the transfer window when Tottenham did not buy for the sake of buying. Mauricio Pochettino has complete faith in the squad that he has put together. Perhaps a wrong purchase might have upset the quiet confidence and camaraderie that runs through the club. For those groaners and moaners who think Spurs lack strength in depth, let�s remind ourselves that among the players who did not get on the pitch were quality footballers like Erik Lamela, Davinson Sanchez and Victor Wanyama, and just wait until Heung-Min Son returns from Asian Cup duty. What a blistering pair of speed aces when he plays in harness with Lucas Moura and in support of the phenomenal Kane, who now cannot stop scoring in August despite still seeking his top form. 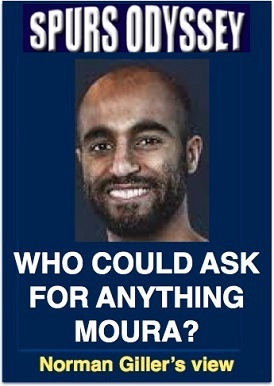 Our guru Paul H. Smith gives man-of-the-match Moura the praise he deserves in his report HERE, enjoying at last having Tottenham goals to describe after they had shot blanks in their last four visits to a Theatre of Dreams that is turning into a nightmare for Jose Mourinho. Spurs took ages to settle and find their rhythm and might easily have been 2-0 down before Jones bulldozed Moura to the ground, an incident that would have certainly brought a penalty had there been VAR in operation. The second-half belonged gloriously to Spurs. Kane�s goal � following an accurate Kieran Trippier corner � was a stunning piece of aerial play, directing a looping header into the corner of David de Gea�s net. Kane�s header was perfectly executed from a set piece, while the second goal featured Spurs at their silky smooth, attacking best, spurting forward with width and penetration. United had plenty of players back but they were caught out by the pace of the attack. Eriksen�s pass was precise and Lucas gleefully turned a low shot into the corner. Skipper Hugo Lloris put his well-publicised drink/drive charge out of his mind and was at his best as he turned Lukaku�s goalbound shot off target. Dele Alli very nearly capitalised on clumsy defensive play by United before Lucas wrapped it up with a neatly taken goal after running on to a pass from the as-ever grafting Kane. 3-0! Tottenham�s travelling army of fans mocked Mourinho unmercifully. �You�re not special anymore,� they chanted. But this Spurs team IS very special. Next up, it�s Watford at Vicarage Road on Sunday in an unlikely top of the table clash. Keep calm. There�s a long way to go. We are under way with the fifth Spurs Odyssey Quiz League. Everybody who takes part gets a personalised reply from me. Don�t let that put you off competing for this year�s prizes for the champion: two books from my Spurs collection with autographs from Jimmy Greaves, Steve Perryman and Dave Mackay, and a framed certificate announcing the winner as SOQL champion. Who was born in Sunderland, had two spells with Tottenham, and which former Spurs team-mate was his manager when he helped Swindon Town win promotion to the Premier League? Please email your answer to me at SOQL3@normangillerbooks.com. Deadline: midnight this Friday. I will respond to all who take part. Last week I asked: Which Tottenham legend, with the second name Dallas and winner of 28 international caps, ran a printing business throughout most of his playing career and from which club did Bill Nicholson sign him?